Upriver/Downriver Unlike most American cities, which were selected based on their strategic locations, Louisville became populated because of complete inconvenience. Upriver/Downriver Unlike most American cities, which were selected based on their strategic locations, Louisville became populated because of complete inconvenience. Early settlers used the Ohio River as a major transportation and trading route but, because of the Falls of the Ohio, were forced to unload (disconnect) their possessions, which were often sealed in barrels, carry them around the falls, and reload(connect) before continuing on their already challenging journey. This process took many days for most travelers so food and shelter was provided by local settlers for this early portage site. As river traffic picked up in the early 1800's Louisville's riverfront became a mountain-scape of wooden vessels waiting to move up and down the Ohio River. 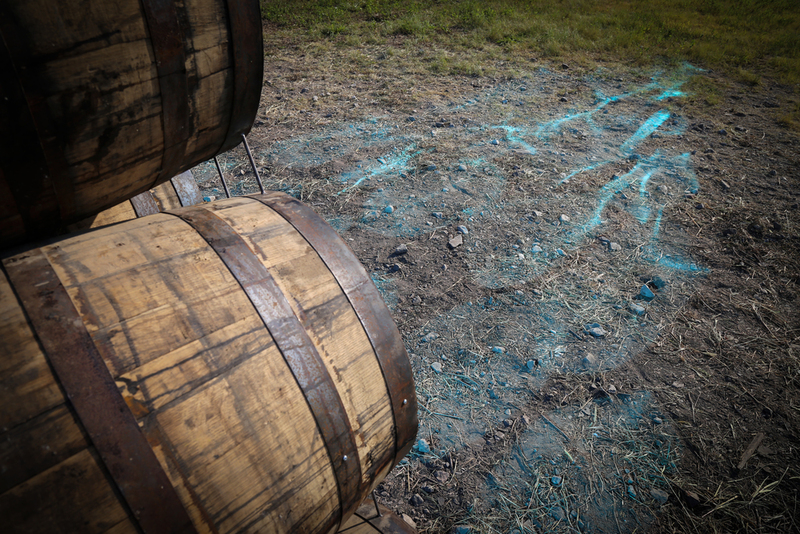 These barrels securely housed and transported everything from gold and metal hardware to tobacco and fabric throughout the United States. 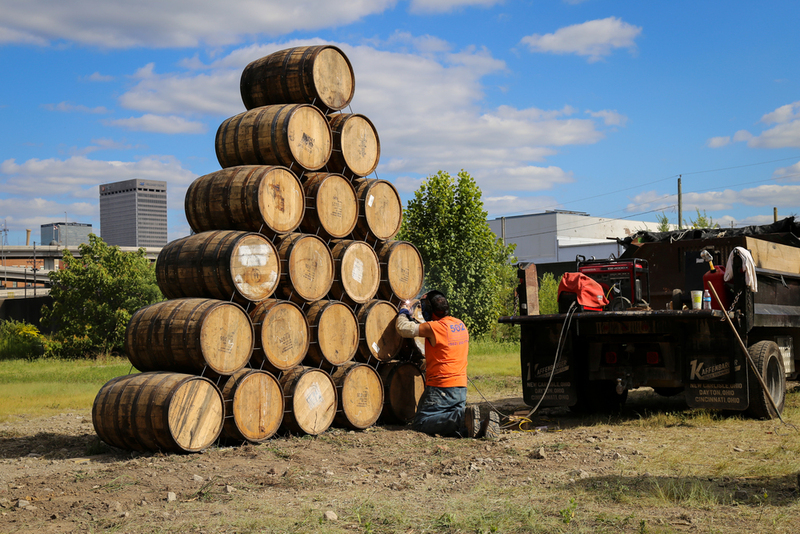 For Reigelman, the barrel became the obvious symbol of this riverfront city. 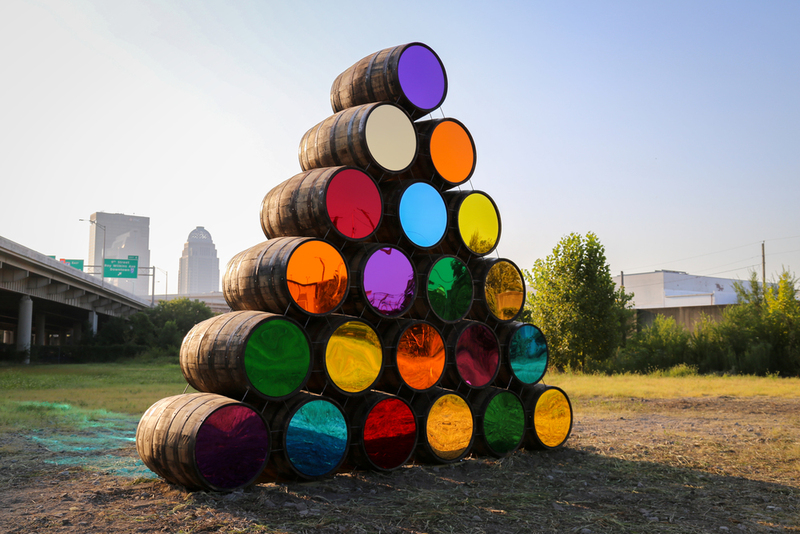 And while barrels are familiar objects in Louisville with distilleries dotting the urban landscape, Reigelman hoped that his approach would encourage pedestrians to view this common vessel through a refreshingly different lens. A reminder that before bourbon filled wooden barrels they housed the personal belongings of entire communities traveling enormous distances for new opportunities as well as an array of goods by local craftspeople seeking new and distant markets. By combining salvaged wooden barrels with sleek saturated mirrored surfaces, Upriver/Downriver highlights the unique history of this post-industrial river community while reflecting its forward-thinking Southern culture.